Don’t be put off by the science lingo—click on the image to download and play a Powerpoint of the nanotrap at work. Cool, right? Courtesy of Dr. Lance Liotta, George Mason University. Several years ago after gardening in my suburban backyard, I found a deer tick attached to my hip. Then came a rash. And then I started hurting all over like I was getting the flu. I wasn’t surprised when my nurse practitioner examined me, diagnosed Lyme, and prescribed antibiotics. I should have been lucky. I had the bite with the beast still attached, in the middle of the classic target rash. I felt like I was dying of flu-like aches and pains. Meet Dr. Alan MacDonald. Okay, so he’s a little wonky when he goes into the scientific details—he’s a pathologist. But remember, those details speak to his credibility. And in this July 2013 YouTube video, he serves up some excellent big-picture explanations that we can all understand. The ongoing work of dedicated researchers like Dr. MacDonald is critical to filling the holes in current knowledge about Lyme disease. It Takes a Village – And the Lyme Village Rocks! Major news day for lyme disease! As many of us know, Lyme disease identified and treated early means a quick road to health. Left to invade the body deeply over time, Lyme and other tick-borne infections can be disabling—and even fatal. Treatment in those cases can be a long, expensive, and rocky road. I should have been on the shortest path. I was treated based on a tick embedded in my hip, a rash, flu-like symptoms, and severe pain all over my body. But when my test came back negative, my practitioner stopped the month of antibiotics that would have saved me from a nightmare that has been going on for three years now. 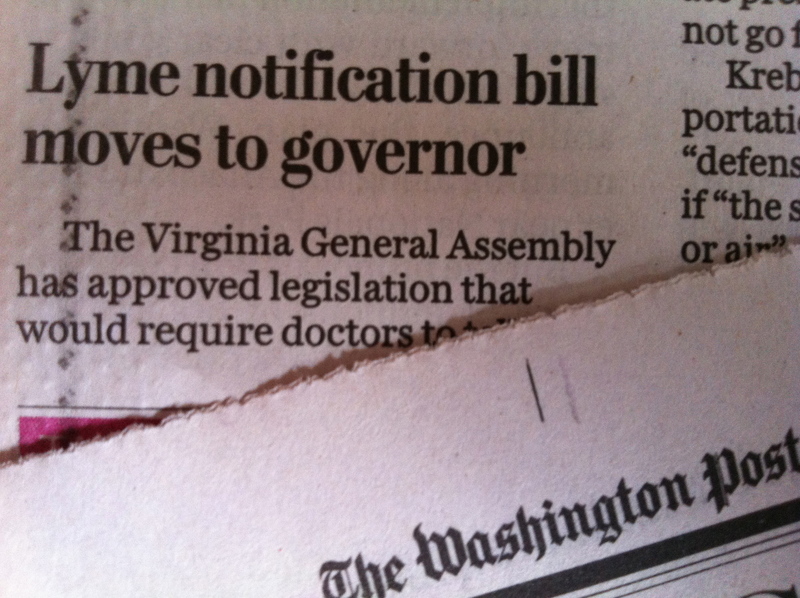 On Tuesday, members on the House side of Virginia’s General Assembly voted on a bill requiring doctors to tell patients that Lyme testing is inaccurate. So when I had the chance to join fellow Lyme advocates in Richmond the day before and help inform delegates, I grabbed my cane and pain medication and climbed carefully into a friend’s van. I wouldn’t have missed that day for anything.